This is my first attempt at a souffle – I have always been scared of making them due to listening to the difficulties people report in getting a rise and the consistency right. More of a challenge then to use free from ingredients to achieve the same effect? It is October – Halloween month so time to get scared and have a go! See what you think. The photograph below was taken after some minutes out of the oven and the rise has reduced but the above photograph was taken within a few minutes of leaving the hot oven. I am not sure if the strange shaped rise was as a result of the small dish or the fact that this is a free from bake. The recipe below makes around 8 small souffles, really tasty to eat them fresh from the oven but it is also possible to double bake the majority to warm them through and although the texture was a little different the souffles were just as tasty. Separate the yolk from the white of the egg – ensure no egg yolk is in the white or it will not whip to the correct consistency. Melt the margarine slowly in a pan and add the flour – this will thicken. Cook for a few seconds and slowly incorporate the milk until it makes a smooth sauce. Simmer to cook the flour. Don’t be afraid to sieve the sauce if it contains lumps. Cool slightly and add the egg yolk and pepper, melt in the cheese. In a separate bowl whisk the egg whites till they form stiff peaks. Add a 1/3 of the egg white to the sauce to slacken it. The fold in the rest of the egg white into the sauce carefully so all the whites are incorporated. Once they are incorporated STOP MIXING – you need to have as much air as possible in the mix and over mixing may mean your souffles will not rise. 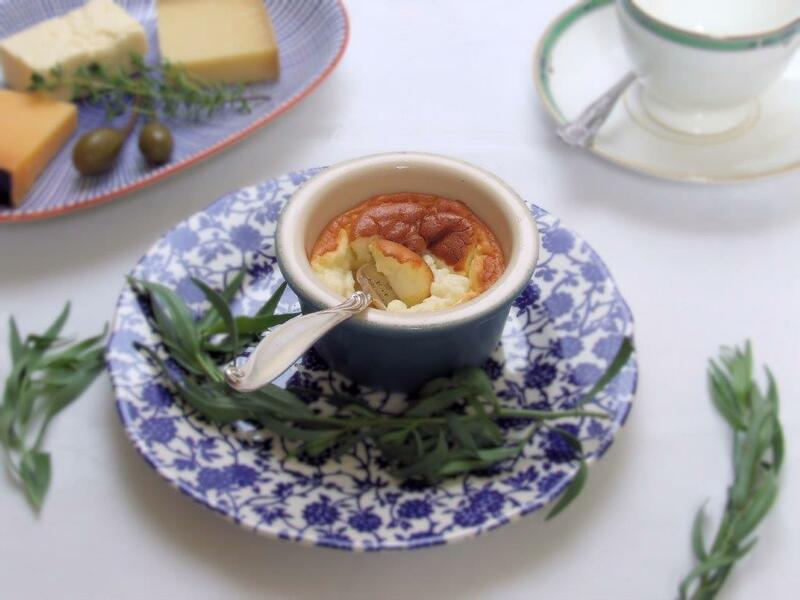 Add the mix to the ramekins and cook for approximately 12 minutes – remove from the oven and serve immediately.